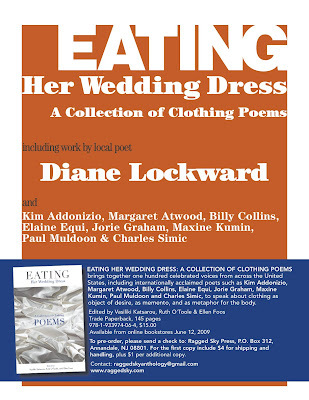 On Friday, April 3, I'll be participating in a group reading for a new anthology, Eating Her Wedding Dress: A Collection of Clothing Poems. The reading will be held at the Paul Robeson Arts Center, 102 Witherspoon St, Princeton, NJ, 7:30 PM-9:30 PM. If you're in the area, stop in. Free poems. Free food. The book will be available for sale and signing. I'm interested in the various innovative ways that publishers and poets can promote and market their books. A few weeks ago I received this flier from the publishers. They asked that I post it locally. Each poet in the book received this flier but with her or his own name highlighted. Pretty clever, I thought. Each poet who attends will read her poem. Mine is "Eve's Red Dress." I'll receive my copy at the reading. Then I might have a bit more to tell you about the book. I'm looking forward to seeing it and to being part of the reading. I'm pleased to tell you that my poem, Idiosyncrasies of the Body, has been selected for the 2008 Best of the Net anthology, published online by Sundress Publications. The image above is an enticement to visit my poem. Editor Erin Elizabeth Smith describes the press's mission as follows: "This project works to promote the diverse and growing collection of voices that are choosing to publish their work online, a venue that still sees little respect from such yearly anthologies as the Pushcart and 'Best American' series. This collection will hopefully help to bring more respect to an innovative and continually expanding medium." I, for one, am tickled silly to be included along with the other 16 poets and poems selected by Dorianne Laux, this year's judge and one of my favorite poets. The notification of my inclusion came as a complete surprise as I hadn't even known that I'd been nominated. So I skipped that whole period of waiting and hoping and went immediately to the good news part. The anthology, out late this year, was posted two weeks ago, but I'm just now announcing this news as when the poem first appeared all my carefully deliberated-upon stanza breaks had been omitted and the poem appeared as one long stanza. I notified the editor, but she was out of town and unable to get to a computer. Now the breaks have been restored, and the poem appears as I intended it to appear. Tell me I'm not the only one who would fuss about missing stanza breaks. To me, they really matter. I think that there's a logic in line breaks; certainly, that was my intention in this poem. Also, as its subject matter is pretty intense, I think those moments of pause are necessary. 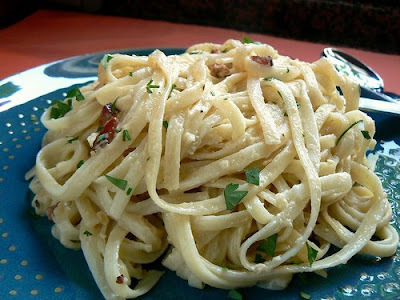 Food blogger Lisa Morgan has been kind enough to feature my poem Linguini today at her blog, Champaign Taste. Needless to say, I'm delighted to have the poem receiving this nice attention. If you haven't visited Lisa's blog, I suggest that you do, that is, if you like food, and who doesn't? She posts great commentary about food, includes beautiful visuals, and offers recipes. And she likes poems about food, thus her interest in my poem. Also of interest today is blogger Robert Lee Brewer's announcement of his 30 judges for April's Poem a Day project which Robert will host at his blog. Check out the list. I'm happy to be part of such an illustrious group. Each judge will review the top five poems for one day and select one for inclusion in an anthology of the thirty selected. Be sure to head on over to Poetic Asides as soon as April arrives. If you lose the address, it's on my blogroll. Sharpen your pencils and get ready to write, write, write! This Saturday's reading, "Girl Talk: A Celebration of Women's History Month," was wonderful. When I organized this event last year, I thought it would be a one-time thing only. But my local library wanted to host it again, and many people asked to have it back. So I used the same format, sent out invitations to a few dozen women poets, and let the pieces fall into place. Some of last year's poets read again; some of the poets were with us for the first time. I wish I could include everyone, but that's not possible. We ended up with 28 but had 3 cancellations due to illness. I asked each woman poet to read one woman-related poem. Nobody gave a long speech. Nobody hogged the floor. There was no male-bashing. Instead, this was truly a celebration of womanhood, of sisterhood, of poetry. We heard poems about grandmothers, mothers, sons and daughters, husbands. We heard a poem about sending off a son to serve in the military on foreign soil. We heard a poem about going back home after years of absence. We heard a poem about the fear of falling. We heard funny poems and poems that wrenched our hearts. Some poems did both. We had a fantastic audience. The room holds 80 and it was full. Many were returning from last year. Some were new. There were a few people who'd never been to a poetry reading before. They plan to go to more. One poet-listener from Princeton brought her childhood girlfriend who turned out to be the sister of my childhood girlfriend who was my blood sister! One woman drove two hours from Connecticut to be with us. One poet-reader brought her 10-year-old daughter who'd selected the poem she wanted her mother to read. After the reading we had a tea party with lots of delicious homemade cookies baked by the poets who volunteered to bake. We sold some books, though not as many as last year, I'm guessing as a result of the economic conditions. But we were rich with poetry and cookies. Picture of me taking a picture of the crowd. Photo taken by Anthony Buccino. Click the link to see a slide show of the poets. Picture of the crowd. Isn't this a beautiful sight, to see all those chairs filled? Front row is Anthony Buccino with his trusty camera. Third row back is the afore-mentioned 10-year-old girl with her mother, poet Nicole Cooley. I usually look forward to giving a poetry reading. But as we all know, some are more equal than others. I had one of the good ones last Saturday. It was the culmination of a service project I did with four students from Caldwell College. I became involved last November when I went to poet Charlotte Mandel's book launch reading in a nearby town. I sat next to some young people taking copious notes. I asked if they were doing some kind of assignment. They said yes and told me their teacher's name. Later, I went to the college's website, looked up the teacher's email, and offered to visit her classes. Instead, she asked me to participate in her next semester project. Since I really liked that the teacher required students to attend area readings, I agreed to participate. As Whitman said, "To have great poets there must be great audiences too." I admired the teacher's goal of getting her students to become part of the audience. 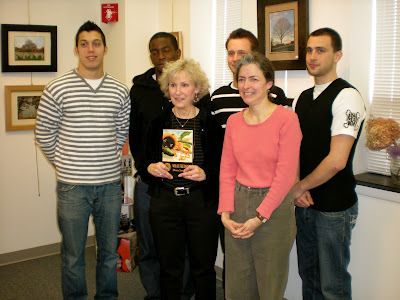 Students in Dr. Mary Ann Miller's Introduction to Poetry course are given the option of doing a traditional research paper or working with a poet on some kind of project. In the past such projects have included helping the poet select poems for the journal she edits, helping the poet select poems for a chapbook, or organizing a reading for the poet. The last possibility was the most appealing one to me. My students were four soccer players, not a poet among them, but I think they are now real friends to poetry. They were a complete pleasure to work with. Since the students are required to put in a minimum number of hours, we met twice in the local library. During the first session, they each bought my book, What Feeds Us, and I asked them to read it cover to cover for our next session two weeks later. We talked about what makes for a good reading and what doesn't. Part of their job was to select ten poems they wanted me to read. I asked them to do that individually rather than collectively. I also asked them to prepare some questions about the poems. During our next session, we compiled a list of the selected poems, then chose the ten most often selected. I suggested that we might begin and end with more "up" poems. And I suggested that we should vary the topics, create some variety. So with those principles in mind, we next created the order in which I would read the poems. We also divvied up the pr, revised the flier they had created, and went over what goes into a press release. We also planned who would do the introduction, who would handle book sales, and who would lead the Q&A that they'd opted for instead of an open reading. Their questions were terrific but would get asked only if no one in the audience asked questions. Then came the reading. All the pr paid off as we had a terrific turnout. Even had to bring in more chairs. 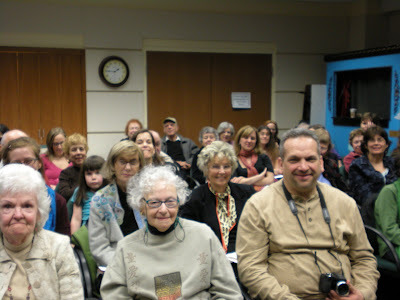 The audience was a great mixture—some more students, some older folks, a few pals. Fellow poet and blogger, David Vincenti, brought his 10-year-old daughter for her first ever reading. She brought her poetry folder to show me. How lucky she is to go to a school (Montessori) where poetry is a regular part of the program and is taught frequently. How lucky she is to have a father who brings her to a reading. And Charlotte Mandel was there which was so nice as she'd started the whole thing. She met the professor whose students had months ago gone to her reading. What a nice way to close a circle. What a nice way to widen the audience. The whole experience was terrific. Now if we could get more teachers to bring their students into contact with living, breathing poets, wouldn't that be nice! If more students had an opportunity to hear the poems in the poet's voice, to sit in the audience, wouldn't we be building the future audience for more poetry? A few months ago I received an email from a high school junior named Izzy, an Ambassador Girl Scout. She was working on a big-time badge, the Girl Scout Gold Award, the highest achievement in Girl Scouting. 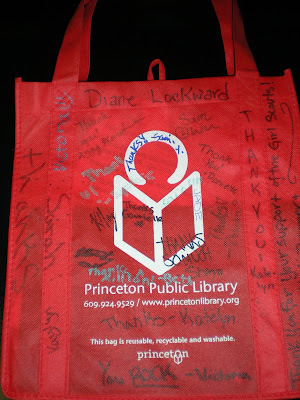 Her project was a community service one called “The Written Word Sleepover Workshop,” a two-day event that focused on the proverb, “The pen is mightier than the sword.” The event took place at the Princeton Public Library which is 50 miles from my house. The girls who participated slept overnight in the Library which they had all to themselves. In designing her project, Izzy's goal was to give young girls in fifth to eighth grades the tools they need to facilitate social change in a peaceful and effective manner: through writing. The project will culminate with a book of the stories, plays, and poems written by the girls during the workshop weekend. The book will be distributed to libraries and congressional offices nationwide "to ensure that the attendees’ voices are heard and that other young people across the country are inspired to write for what they believe." Izzy's resourcefulness was revealed early on as she set about locating authors. I don't know how she found the others, but she found me via an online search. When she learned that I work as a poet-in-the-schools, she decided to invite me to participate. I was joined by two playwrights and a fiction writer. My job was to give a brief reading to a dozen 5th and 6th grade girls. Although I'd initially been asked to read poems that had some kind of social message, when I learned that all my girls were that young, I decided to read poems about the lives and family relationships of girls. I read one about my grandmother, another about my mother, and one about my daughter. Then I met one-on-one with each girl to offer some feedback on the poems written during the program. I was happy to participate in Izzy's project as I was so pleased to see someone design a project around writing. Also, I hope Izzy is right when she suggested that I would be contributing to a "workshop that promotes nonviolent protest and that fosters the communication skills of tomorrow’s leaders." There was no remuneration for my participation, but I was presented with the bag you see above, an "earth-friendly" bag, signed by each of the girls. Note the note at the bottom: "You Rock." Indeed I do. A box of Thin Mints would have been nice, but I was nourished in other ways.